Urist likes giant kea for their intelligence. Giant kea are airborne infiltrators more than 200 times the size of normal pesky kea. They are incredibly dangerous animals, so much that they are now the flying king of beasts for DF2012, contested only by the Giant mosquito as of August 8th, 2012. Their habit of going into your fort and stealing your stuff will mean these monsters will come right into contact with your dwarves and fight. 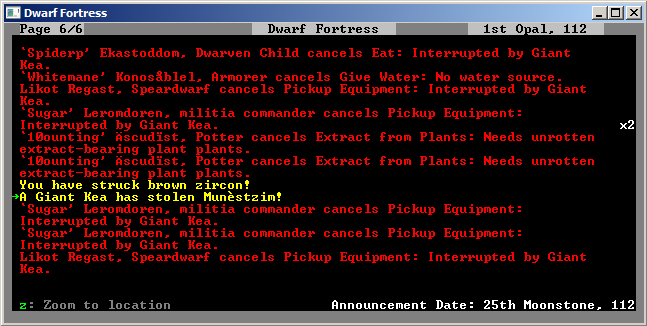 And do not expect a civilian, unarmored dwarf to win any of these fights. Giant kea will kill your dwarves faster than you can say, "It's just a big parrot, what harm could it do?" This animal is capable of stealing artifacts. Additionally, they come in groups of 5-10. As such, they can quickly become your fort's top concern. They tend to fly away when targeted, but that won't stop them from returning to steal again later. Overall, these things can be a huge threat to a fortress. When butchered they leave behind useless feathers. Some dwarves admire giant kea for their curiosity and intelligence. This page was last modified on 30 July 2013, at 13:04.